There are some rumors about Samsung Galaxy M series, which Samsung India detailed some information related to it. Samsung India has put up a micro-site for the affordable lineup which provides details about the design, features and launch date. According to www.sammobile.com “The micro-site came up not too long after a report on the Galaxy M launch. It included comments from Samsung’s mobile head in India who confirmed that these devices will be sold online only in the country”. Galaxy M Features and Launch Date! While the exact specs of the phone are still under wraps, the Amazon listing shows that they will have dual rear cameras, a rear-mounted fingerprint sensor, USB-C, and a headphone jack. Some reports had said that the Galaxy M series would be Samsung’s first with the Infinity-V display. 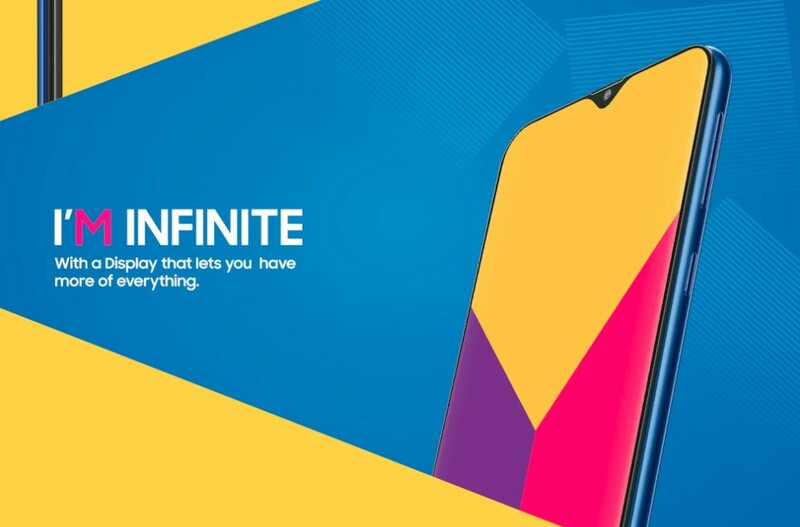 The device render on the micro-site clearly shows the waterdrop notch at the top of the flat Infinity display. Samsung also mentioned that Galaxy M will have an Ultra Wide camera. The Galaxy M30 will have three cameras at the back while the Galaxy M10 only has one. It is thought that both the Galaxy M20 and Galaxy M30 are expected to feature 5,000mAh batteries. The company also confirms support for Fast Charging over the USB Type-C port. “Given the absence of antenna bands on the device it would seem that the Galaxy M series will be made out of plastic. That’s what we can expect for the entire lineup. With its relatively affordable price tag of under $200, that would be the expectation. Don’t keep your fingers crossed for an OLED display at this price”, writes www.sammobile.com. The launch of the Galaxy M series is going to happen on January 28. The smartphones will be released in India first before they’re made available elsewhere. And also the handsets will be available on Samsung’s website and Amazon in India.